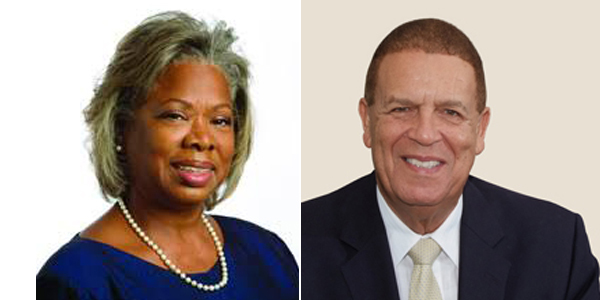 Hamilton Princess & Beach Club is commemorating Black History Month by hosting two dinners that will celebrate prominent black Bermudians, Dame Jennifer Smith and Sir John Swan. A spokesperson said, “Dame Jennifer and Sir John, both former premiers of Bermuda, will each be honoured with a dinner at the hotel, open to the public. “Guests will have the chance to rub shoulders with the honourees at a short reception and hear them speak about their experiences before sitting down to a three course meal. A portion of the proceeds of the dinners will be donated to charities of Dame Jennifer and Sir John’s choice. “The two menus have been carefully created by the honourees and the Head Chef of Marcus’ to reflect the foods that they associate with black Bermudian culture. The dinner will be served family style, so that diners can try everything on offer. “Dame Jennifer will be honoured on Wednesday, 13th of February and her menu features Bermuda Onion Tart, Grilled Wahoo with Oven Dried Cherry Tomatoes and Black Olives with Bread and Butter Pudding for dessert. Her chosen charity is the Bermuda Heritage Museum. “Sir John’s dinner will be held on Saturday, 23rd of February and the menu he has chosen includes Cod Fish Breakfast, Crispy Yard Bird and Good Ol’ Apple Pie. His chosen charity is the Salvation Army. “Both of the dinners will be accompanied with Bermudian cocktails, both classic and contemporary, featuring Gosling’s Rum, and wine from Butterfield vineyards. “The dinners start at 7pm and include a welcome cocktail [non-alcoholic option available], hand passed hors d’oeuvres and three courses. Tickets can be bought from www.PTIX.com and cost $90 per person, plus gratuities, or $130 including wine pairings, plus gratuities.